Whether you are selling or just settling into a new home for many years to come, curb appeal matters. Your mailbox is one of the first things people see as they enter or pass your home- and it says a lot! When I moved to Hawk Hill- my mailbox said BORING, and that was not the message I wanted to send! 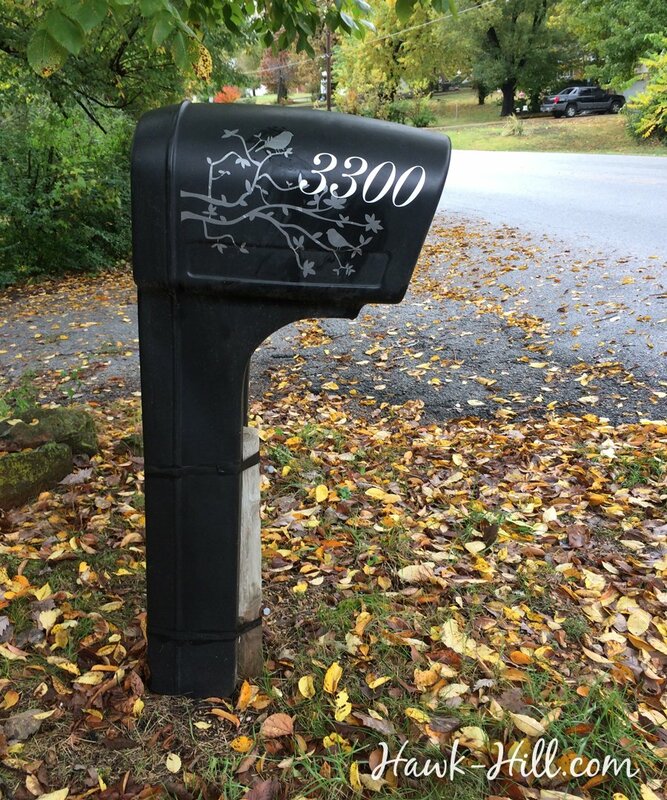 In this tutorial I’ll show you how to layer homemade cricut cut decals or custom vinyl decals to create a classy mailbox design that’s functional and attractive. One of the fastest and easiest but most dramatic home improvement projects I have tackled is one of the very first projects I did after purchasing Hawk Hill. 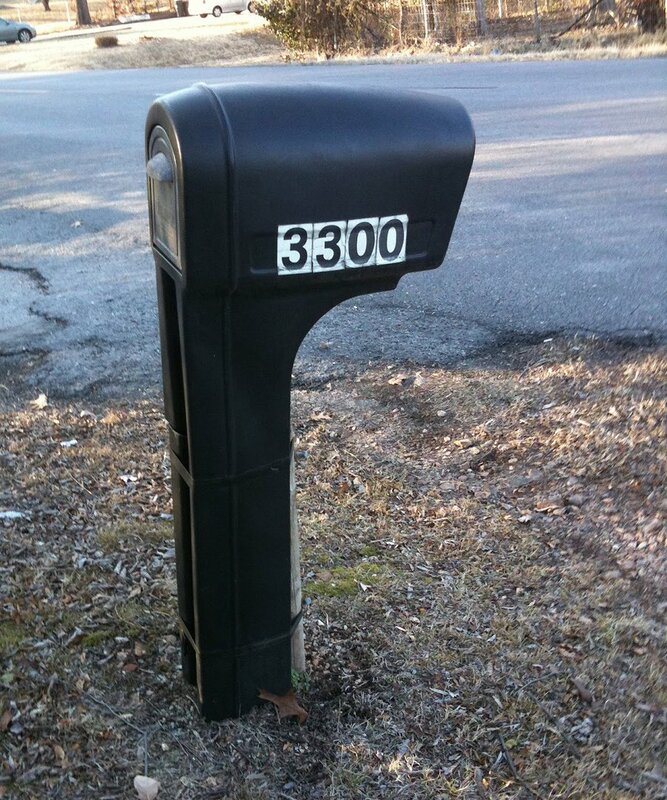 This lovely old home had a terribly generic mailbox with dirty peel and stick house-number stickers. It had no character- so it had to go! Replacing the mailbox was tempting. I felt like either a replacement with an old fashioned mailbox or an upgrade to a newer style locking mailbox would improve the curb appear, but I decided that rather than spend an afternoon and several hundred dollars installing a new mailbox, I thought new, unique numbers might do the trick- and I was thrilled with the result! Although elegant vinyl numbers alone would have been a huge upgrade to the numbers already on the mailbox, I decided to be playful and also place a subtle background image. First, I calculated the size I’d need, (about 3″ high for the letters) and purchased a background image, birds on a branch, in a fairly dark color from a seller on etsy and house numbers in a highly visible shade of bright white, from another seller. Contrast is extra important on the mailbox- your numbers standing out well on your mailbox and on your home can be the difference between service people making it on time and packages being delivered to the right house. Because no one wants dinner guests calling 15 minutes late 3 miles down the road- make sure any background image is colored so it mostly blends into the background in daylight and darkness, and the letters are big, an easily readable font, and a highly visible color. If you plan on repeating this project for your own mailbox, remember to order or die-cut 2 sets of all your decals. You’ll need one set for each side of your mailbox. After spending much longer than I anticipated scraping the old letters off and cleaning the road grime from my mailbox, I used rapid tac to apply and float my decals around on the mailbox till they were in the right spot, then used a rigid card to squeeze out the floating solution and adhere the decals permanently. I really recommend the rapid-tac, if you are going to the expense of custom decals, the surface treatment works out to be a good investment. I’m the worst at placing decals, even after applying large decals a horse trailer, but since I started using it to pre-treat my surfaces (the last round of applying decals to my trailer) I keep having great results. Deb was particularly impressed with this project, though less impressed with the fact that I made her practice her being-tied-up-patience while I worked on it. 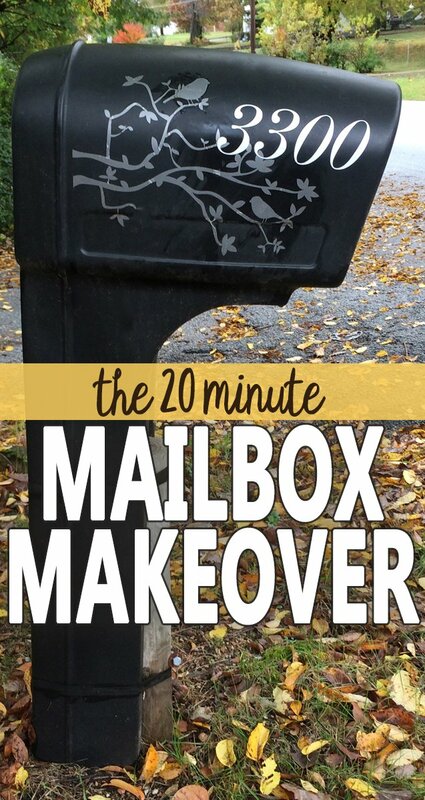 I love your updated mailbox, but what really caught my eye in this post was that gorgeous Curly! (Oh look, my equestrian obsession is showing again. Whoops!) 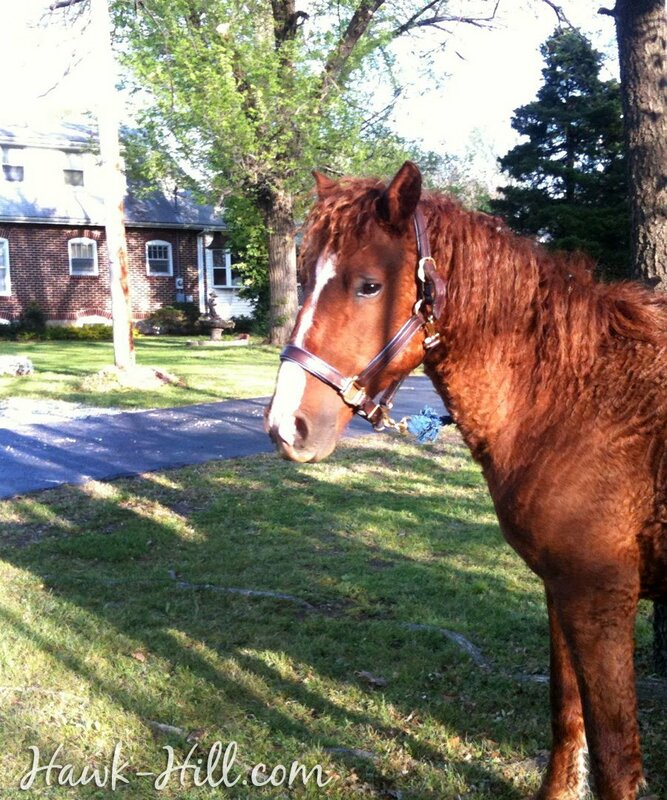 Maybe it’s just the life-long horse owner in me, but I’d really love if you’d introduce your readers to miss Deb in a future post. Thank you! I will definitely do that! I have two curlies and you won’t believe the spots on her brother! Do you think Rapid-Tac will work on Mylar decals? Not sure you will answer back since this post was from a few years ago, but worth a try. Also, where did you buy Rapid-Tac? Hi Tasha, thanks for reading! 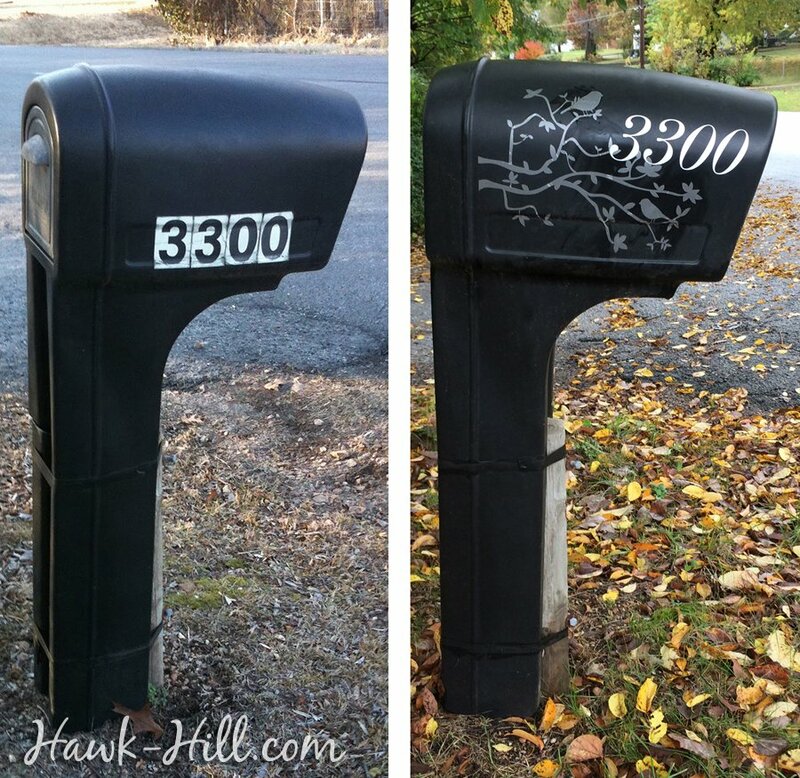 Are you doing a decal on your mailbox? Would love to see your take on this project!